A month before the election of President Trump I read a disturbingly revelatory book: The End of White Christian America by Robert P. Jones. 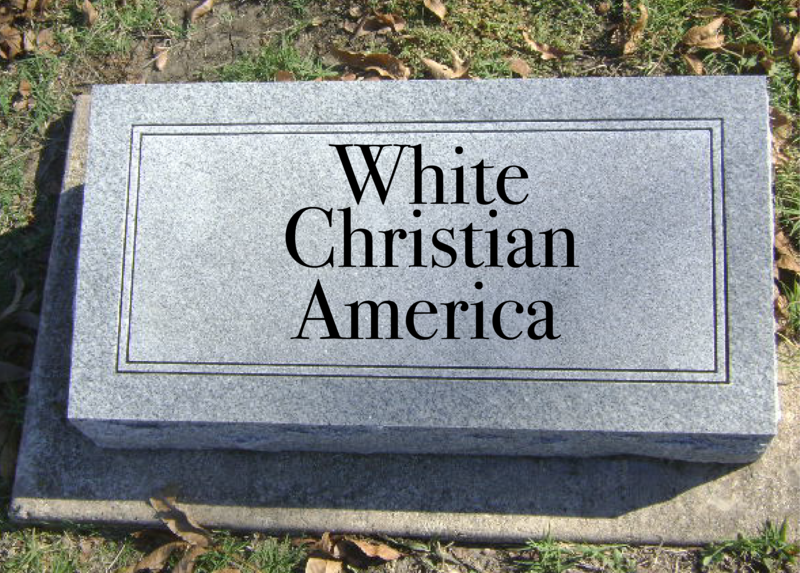 Using statistics, this consultant and researcher, who founded the Public Religion Research Institute, demonstrates the what we know as White Christian America (WCA) is on its deathbed, in a hospice-like situation yet still in denial. He claims that the ascendance of what has been perceived and prominently experienced as the dominant worldview within American Society for the past 240 years is ending or over primarily because of the response of WCA to the questions of equality (both in the civil and ecclesiastical spheres) of LGBT people and civil rights (racial equality). He lauds the massive collection of institutional creations, from church to hospitals to non-profit social organization, that have incubated and curated the common greater good of our country during its life. Yet points to its demise due to both internal and external factors, stemming principally (when one looks at the situation through the narrative told by statistics of membership, involvement and activity) from a response to racial issues and the movement for civil rights through general accommodation and participation in the institution of slavery until the Civil War, followed by a continued associative defense of segregation throughout the 20th century. This led WCA to political association with groups and positions that stuck WCA in a quagmire of partisanship and internal incoherence. From this paralyzing espousement of a particular political perspective the WCA then struggled to adequately address issues of equality, recognition and inclusion of lesbian, gay, bisexual and transgender (LGBT) rights. Jones shows that WCA has been decreasing in numbers and significance (money and societal influence) since the 1960s in particular. Long have we heard that this proclaimed the death of liberal mainline denominations (like my own Presbyterian Church of the USA). Now Jones says that statistics show that the Evangelical, more right-leaning churches are now decreasing at an equally diminishing rate, even surpassing the mainline churches as they seem to be leveling off to a new equilibrium. Jones hypothesizes that the Mainline has stopped it’s numerical hemorrhaging by recognizing the importance of these two issues, the historic hypocrisy of the stance that the church took in terms of proclaimed values and biblical scholarship. Family: Gay Marriage and White Christian America. Many of those abandoning the traditional religious institutions today (18-34 years of age) identify negative religious teachings about gay and lesbian people and their relationships as a major factor for their disaffiliation. Statistically we can observe a direct correlation between the more liberal one is gay rights and the lower rate of religious affiliation. While some would invoke religious orthodoxy, or moral relativism, the statistics point to the reality that the moto of “no compromise” (embraced primarily by White Evangelical Protestants) is a losing battle, whose failure rate is picking up speed. Invoking religious liberty as the right that enables this rejection of gay marriage seems to only fortify this exodus among the Millennial generation. While many would say that this is a question of doctrinal purity versus moral relativism, or a face-off between syncretistic political correctness verses convicted Christian confession; Jones points to the decreasing attendance and participation of younger Christian Americans which in large part is explained by them as a response to what is perceived by them to be a non-sensical, inherently hypocritical, and internally irrational understanding of the Christian mandate to love God with all of who we are and to love our neighbors in the same way. The numbers point to the incoherence in the message of Christianity: God is love, known most accurately in the incarnation of Jesus of Nazareth who not only taught, that life is about loving God with all of our being and that part of that is loving ourselves and each other in the same way, but lived it in such a radically self-sacrificial way that his death on a cross could not prevent him from living anew and forever, rooted in a new way of being. That message is preached and adhered to while simultaneously WCA has worked against the extension of rights, to those deemed unworthy because of their sin, in terms of equality, access to health-care, marriage and parental rights. Race: Desegregating White Christian America. He points to the conclusion from our troubled history around failed efforts of segregation, the currently viewed impact of implicit bias and our stained institutional history that we must create something new, or at least transform existing institutions in order to bridge the deep racial divide that characterizes America today. We have no strong institutions equipped to nurture strong leadership across racial divides. Long thought of as the avenue for action, the arena of public schools has not succeeded in doing so. The church by its mission should be the space in which members are encouraged, empowered and equipped to move beyond worldly perspectives and limitations (around segregation) yet the theology and liturgy of the Church seems to have had little impact on actual racial composition of Christian congregations, both in the past and present. Sunday morning remains the “most segregated hour” of the week in America because as few churches continue today to have overtly discriminatory or exclusionary policies and practices, and have actively sought to foster integration, most remain remarkably segregated. Jones concludes from his research that white evangelical Protestants have been the most complicit group within WCA in our nation’s troubled racial history. A majority of evangelicals come from the South, the former confederacy resisted active calls to advocate for racial justice, focusing instead or morality related issues and soul-winning. White Mainline Protestants have been stronger at being a public Christian voice for racial justice, but from the lay of the land today they seem impotent to be a force for grassroots cultural or ecclesial change. Today’s churches, evangelical and mainline, often reflect the social segregation of the status quo. To discover and embrace a relevancy today the church needs to engage in meaningful discussions and praxis around racial inequality, not settle for the path of least resistance: fortifying the walls around their communities. The Church of WCA needs to pioneer a new kind of Christian community that transcends the color line. In a nation that is increasingly multi-cultural, multi-lingual and multi-ethnic; WCA has sided with the comfortable convention of tribalism, racial supremacy and justified segregation in the objective of maintaining the status quo without recognizing the enslaving and ensnaring dynamic both latent in such a routine political position and in our socio-economic structures. Again younger members are abandoning the WCA seeing the inconsistencies and incoherency with the message of Jesus summarized with a teaching of the apostle Paul and the lyrics of a contemporary hymn. There is no longer Jew or Greek, there is no longer slave or free, there is no longer male and female; for all of you are one in Christ Jesus. Galatians 3:28. “In Christ There is No East or West” Hymn by John Oxenham 1908. There is disagreement with the observations and conclusions Jones makes. In the religious sphere, some voices will object to the validity of an assertion based upon polling and numbers (and not just because of the polling mistakes made in the past presidential election) rather than upon the primacy of God’s word and doctrinal purity and fundamentals. In a changing world, accelerated by immigration, the ascendance of what have been historically racial minority populations and cultures, continual technological transformation and climate change; some argue that this is merely syncretistic or culturally-collaborative politically-correct-ese. Polling statistics and quantifiable trends don’t speak the same language spoken by theology and creedal doctrinism in terms of the religious epistemology and ecclesiastical praxis. One measures numbers and trends using polls and statistics, whereas the other plumbs knowledge and being through language and theology. Yet he tells the story of three church communities that have seen a reversal of this decline towards the tomb and the dawning light of the womb in a different response to these questions which is both categorical and institutional, pragmatic and theological. The election of President Trump seemed to annul the assertive hypothesis of this book as the perceived to be forgotten and marginalized Appalachian hillbilly culture of White Christian America seemed to be ascendant. Yet the Trump reign, underpinned by a justification to alternative facts and a yearning for who things used to be, will merely hasten the demise of White Christian America as not only numerically dominant but also societally irrelevant. The call of the church is not to partisan obeisance or political confederacy but to be ecclesia in the original Greek sense of the word: an assembled collection of people gathered in a common vocational call out of the dominant culture to the creation of a new civic community embracing Jesus’ radical ethos of active love. The book begins with a cleverly written obituary for White Christian America but ends with a prophetic pointing towards a new dawning light and potential. The question of which way we will choose as a nation or as a national church is beyond me. I can though answer myself to what it means for me to be simultaneously Christian, American and White in 2017.